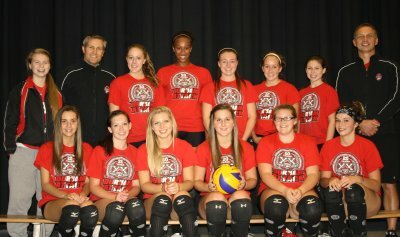 DA 16U Red Girls Win Tier II Gold at 2012 Provincials! On Day 1 the DA 16U Red team finished 1-2, winning in straight sets against the Barrie Elites Blue. Victory narrowly escaped their grasp against Leaside Lightning and the Georgian Cubs. The final match of the day against the Cubs was however one for the books! After a disappointing 20-25 loss in Game 1, the girls regained focus and claimed Game 2 with a commanding 25-12 win. On to the tie-breaker! Relentless in their pursuit of victory both teams were prepared to “leave it all on the court” and so they did. A seesaw battle ensued ending in a score of 25-27! Despite the loss, the game was a testament to the spirit and ‘never give up’ attitude of the girls; a sign of good things to come! On Day 2, the team had a renewed energy and their positive mindset enabled them to go 3-0 for the day, against the Astros and Phenix in straight sets, before rallying from an 8-2 deficit in the tie-breaker, to take the win 15-13 against the Stingrays. Day 3’s sudden death format meant the girls had to once again leave it all on the court. Attack readily took the first match in straight sets over the Brantford Tornadoes followed by a tiebreaker win against the Rapids. The victory moved the team into the semi-finals where the girls would once again face the Stingrays. However, today there would be no tie-breaker and Attack commanded the court 25-21 and 25-15, earning the right to play for gold! The final match was against the Toronto Diamonds. The girls fell 21-25 in game 1 but their determination would prevail and they took game 2, 25-18. Once again the girls found themselves in a tie-breaker however this win would not allude them. Both teams fought hard, going point for point, but Attack Red’s determination and perseverance would be undeterred as they pursued their goal and took the tie-breaker 20-18 and won Provincials Gold in their division! Congratulations Team – we are all very proud of you! On behalf of coaches Mike and Jacek, and the girls: Hannah B, TJ, Hanna G, Jordan, Brittany, Madison, Joanna, Taylor, Ally, Randi and Emily, who wore pink and black ribbons in remembrance, the Durham Attack 16U Red team would like to dedicate their 2012 Provincials Gold, in memory of Coach Nicole’s father, Marcel Vandenheuvel. Girls 16U Red Win Division II Provincials Gold! A picture is worth a thousand words…Girls 16U Red winning Provincials Gold…priceless! Girls 16U Red win Bronze at McGregor Cup! Someone said there was an all-star hockey game in Ottawa the weekend of January 28th? Who knew! 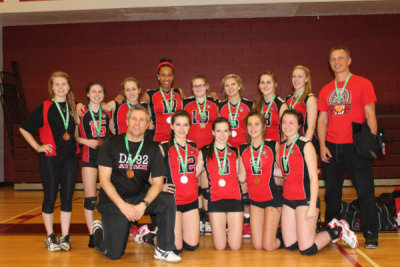 The real excitement was on the courts as the 16U Red girls took home Bronze at the McGregor Cup! Attack took the court against Pegasus for the first match of the day and despite a shaky start the girls quickly turned things around with their strong offence and held court winning 25-15, 25-12. Next the team met the Maverick Colts. Stellar serves again set the tone for the game as Attack dominated 25-8, allowing few earned points for the opposition. The Colts’ pressed on and played a tighter game 2 however the Attack girls held strong to take the win 25-21. In the final match of pool play, the girls faced another Maverick team, the Trailblazers. Attack took an early lead, and while the Trailblazers attempted to keep up they were no match for Attack’s powerful offence. Time and time again, Attack delivered aces, line drives and picked strategic corners, catching the opposition flat footed. Attack’s offence ‘blazed the trail’ to command the match 25-14, 25-15, earning the team a first place finish in pool play. The all important cross-over match was next. The team had previously missed the chance to play in a medal round and was determined not to let the opportunity escape their grasp. In the crossover Attack faced DRVC, ranked first in this tournament. The competition played a tighter game than that faced earlier in the day but the girls pulled together to amass a sizeable lead. While DRVC attempted to chip away at the gap, Attack would maintain their lead and prevail 25-19. In game 2 the girls found themselves fighting to come from behind and while they worked well together narrowing the gap and fought hard to prevent DRVC from gaining those final few points, this game would go to DRVC 25-21. The tie-breaker began with another Attack serving rally and a supportive defence enabling the team to keep control of the ball. At half time Attack led 8-0 and finished with a decisive 15-5 victory. Next it was Attack against the Stampeders. The girls played a solid game, maintaining the lead throughout, demonstrating both a strong offence and defence to take Game 1 25-17. Game 2 found the teams jockeying for position and the teams remained within a point or 2 of each other but this time the Stampeders would take the win 25-23, disappointingly forcing a tie-breaker. In the tie-breaker, something was amiss and Attack struggled – the score was 2-8 at half time. The girls fought back but the gap was too large and their hopes of going for gold were dashed by a 9-15 tie-breaker loss. The bronze medal match was to be against the Astros. The deck was shuffled and despite the earlier loss, the girls took the court with a positive energy and a renewed focus. A powerful serving rally supported by great defence set the stage and Attack powered ahead with an 11-0 lead. The Astros managed to squeeze out a few points but fell hard as the Attack team commanded the court 25-9. In Game 2 Attack started out strong and acquired a sizeable lead. The long day appeared to take its toll as the Astros caught up one point at a time. The Attack girls would however pull together and give it their all to take Game 2 27-25 – a Bronze medal win at the McGregor Cup! – way to go team! Congratulations Ally, Britany, Emily, Hanna, Hannah, Joanna, Jordan, Madi, Randi, Taylor, TJ and Coaches Mike, Jacek and Nicole! Your positive attitude, commitment to giving the best of yourself and your support of each other will undoubtedly help you reach new heights – the best is still to come! Someone said there was an all-star hockey game in Ottawa this past weekend? Who knew! The real excitement was on the courts as the 16U Red girls took home Bronze at the McGregor Cup! 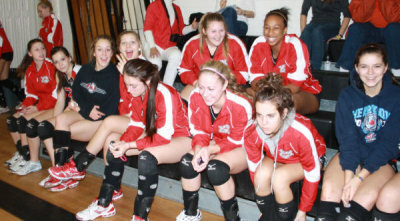 On December 17th, DA 16U Red was off to Trenton for the second OVA tournament of the season, the Challenge Cup. The first match of the day saw the girls face off against the Maverick Colts. Attack’s commanding offense enabled the team to take an early lead and the girls never looked back, owning the court, 25-16, 25-13. In their second match of the day, Attack met team Phenix. The Attack girls served up more of the same – killer offense and solid defense – the result – a decisive 25-9,25-16 win, and a first place finish in pool play. In the all important crossover match, it was Attack versus the Maverick Stampeders. The teams were more closely matched and as they jockeyed for position, the fans were treated to some nail biting rallies and excellent defense at the net. While Attack maintained the lead for most of game 1, their concentration was broken, resulting in their first loss of the day, 21-25. Undeterred by the loss, the girls’ regrouped and while the Stampeders remained close at their heels for much of game 2, the girls persevered to take the win 25-19. In the tie-breaker the Stampeders galloped off to a 11-4 lead. Attack called a timeout and the girls stepped back on the court refocused and with a ‘never give up’ attitude. They fought back hard, gaining one point at a time, but on this day it would not be enough – a disappointing 12-15 loss and dashed hopes for the medal round. The final match of the day against Ottawa Fusion, ended much like the day began – with a solid 2-0 victory. DA Red you are a strong, united team – you have proven you are capable of commanding the court. You are a team that consistently demonstrates what it means to be a ‘team’ – you share the victories as well as the losses, but more importantly, you pull together to stay strong, and positive, looking ahead with the knowledge that there is so much more to accomplish. A solid finish at last season’s Provincials earned the team the right to play in the Championship East division where they would face some of the top teams in Ontario. Ranked 11th coming in to the tournament the girls knew it would be a day of tough competition and they were up to the challenge. The first match of the day saw the girls face last year’s provincial bronze medalists, the Ottawa Mavericks. Despite a slow start, the team was able to turn things around and take the lead but after relinquishing several points in the form of net violations and other errors, they were unable to regain momentum and lost the match 0-2. The girls faced the 2nd ranked Etobicoke Titans in their second match of the day. In Game 1 several DA errors afforded the Titans an early lead and the girls struggled to keep pace. Undeterred by the loss in game 1, the girls took the court and took an early lead. A hard fought rally renewed their confidence and the girls came together determined to maintain their lead. A strong serving streak solidified the 25-22 victory. The tiebreaker saw the girls open up with a strong offense and solid lead however the victory eluded them, 11-15. After finishing 3rd in pool play the girls faced DRVC in the crucial crossover match. Game 1 found the girls fighting to come from behind. A strong serving rally narrowed the gap and sheer determination kept a point for point battle going strong. A hard fought rally at 20-22 revived the team and their ‘never give up’ spirit. The team continued to battle serving up a well timed ace to make it 24 all. And while today a close game 1, 26-24, would go to DRVC, it was clear our girls have what it takes! The girls kept stead with their opponents early in game 2, however several net violations and lack of coverage sealed the match for DRVC. The final match of the day was against the Titans. Game 1 was evenly matched each team jockeying for the lead. The fans were treated to some solid blocks, strategic tips and excellent offense. Unfortunately the girls were caught flat footed and having given up a number of unearned points gave the win to the Titans 23-25. Our girls owned the court in Game 2, 25-14, the Titans unable to defend against Attacks’ powerful serves. Unfortunately, unable to recover from a slow start, the tie-breaker would result in a disappointing 9-15 finish. Going in to the tournament the 16U Red team knew it would be an uphill battle as they faced some of the top teams in the province, however they held their own – they played as a team, with passion, determination and perseverance – a sign of good things to come! Special thanks to Coaches Mike, Jacek & Nicole for your passion and undying support.